Click on any picture for more information and pictures of each building. These are my favourite buildings in Moscow - love 'em or hate 'em the seven look-alike gothic skyscrapers of Moscow have dominated the skyline of the city for over forty years, so much so that a stylised representation of them became the symbol of Moscow for the 1980 Olympic Games. 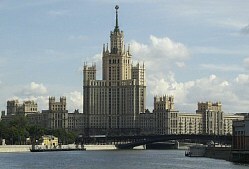 During the Cold War the style of the buildings was derided in the West, often described as "Stalinist Gothic" or "Stalin's Wedding Cakes", they indicated the tasteless excess and creative bankruptcy of Soviet architecture. However, although they weren't completed until the 1950s, the designs were conceived in the 1930s at a time when buildings of a similar style were being constructed in New York. The seven buildings are known collectively in Russian as Vysotniye Zdaniye , literally high buildings, and were knocked up in the 40s and 50s using, it has been said, slave labour from prison camps (this can often mean that they are of better construction). They were commissioned by Stalin but a few of them were not completed until after his death in 1953. These are the tall buildings of Moscow, 26 to 32 storeys high, built towards the end of the 1940s and the beginning of the 1950s as part of the unitary plan for the reconstruction of Moscow which was adopted by the Soviet Government in 1947. The seven buildings were situated at the most important parts of the City. Viewed from a distance they emphasize the picturesque hilly backdrop and the radial-ring layout of the City panorama. The sheer size of the Vysotniye Zdaniyes make them extremely useful for orienteering and enrich the city's skyline. A complex carcas of reinforced concrete and steel were employed in the construction of each Vysotniye Zdaniye. In the course of the reconstruction of Moscow in the 1930s, a lot of churches, cathedrals and bell towers were destroyed and in their place appeared numerous multi-storey buildings and the skyline of the city underwent profound change. In the reconstruction plans there was a clear preference for monumental designs for buildings and boulevards and it was feared that Moscow would lose its distinctiveness and historic character. It was hoped that the raising of the skyscrapers in a belt around Moscow would restore the traditions of ancient Russia. 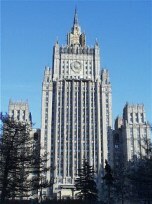 The skyscrapers were to be built at specially significant and prestigious sites in order to create a system of focal points linked to the historic centre of Moscow that clearly marked its boundary. The University complex on Sparrow Hills (formerly Lenin Hills) at the same time symbolised the south western zone and the direction of the city's development. The Ukraine hotel and the apartment block on Kotelnicheskoy embankment accentuated major districts on the course of the Moskva river. The Leningradsky hotel on Komsomolsky Square is on the site of the capital's major rail terminus with 3 stations situated at this point. The Vysotny Zdaniyes on Smolenskaya, Kusdrinskaya and Red Gate squares are situated oat designated intersections of major arterial roads with the Garden Ring road.